In the previous post, we have discussed in detail some strategies on how to arrange shuffled sentences into a coherent paragraph. Although I have mentioned in that post that it was not that hard, it appeared to be the opposite. This time, we discuss why is it actually not as hard as you think. In actual examinations, what makes a Paragraph Organization test a bit easy is the availability of choices. For instance, let us answer the question in the previous post — this time with choices. 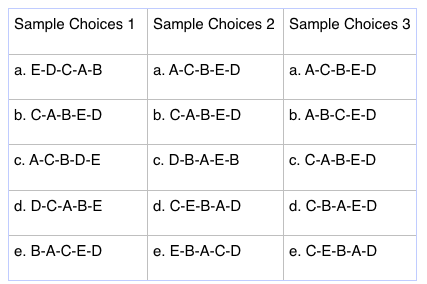 Use Sample Choices 1 in the table below. If the person who constructed the test used Sample Choices 1, then it is very easy to answer because once you know that C is the first sentence, then you don’t have to read the whole paragraph. There is only one choice which has C as the first sentence; that is, b. Now, suppose the person who constructed the example used Sample Choices 2. In the choices, there are only two sample choices which begins with C (b and d), so still, you eliminate the three wrong answers. Sample Choices 3 is well-thought because each choice might be equally likely to be chosen. A and C are good candidates as the first sentene and D is a very good candidate for a conclusion. Still, even though Sample Choices 3 is better made (on the perspective of the examinee), knowing the first sentence will still eliminate three choices. That is the reason why I was saying that Paragraph Organization is not that hard. This is because in Paragraph Organization questions, once you know the first sentence (or sometimes the last), it is possible for you to eliminate the other wrong answers. The more wrong answers you eliminate, the higher is the chance of getting the correct answer. you have a 33.33% chance of getting the correct answer in Sample Choices 3. In other types of exams with 5 choices where you don’t know the answer and you just guess, you only get 1/5 chance of getting the correct answer or 20%. Since it is likely that you will know the introduction sentence in a Paragraph Organization test based on the tips that I have given you, I think it is quite reasonable to use the calculation above. That is why Paragraph Organization is easier than many multiple-choice type exams. In the next post in this series, I will give share with you my personal strategy on how to answer Paragraph Organization questions.